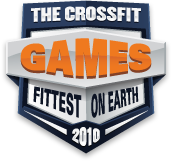 Do you have aspirations of competing in the CrossFit Games? Can you stand to be average? Take a look-see. Some of the stats might surprise you. For those who fall as outliers, there is hope. Tommy Hackenbruck, 2nd place in 2009 is 6'1" and 200 pounds. The oldest male competitors are James Fitzgerald (1st in 2007), Jerome Perryman (2nd in the Northwest Regional) and Braden Lutz (1st in the Central East Regional). They are all 36 years old. Deric Maruquin is 5'3" and 150lbs, two inches shorter than Speal (5'5" and 140lbs). Lindsey Smith, 5th in 2009 is 5'11 and 155 pounds. Cheryl Brost, 2nd place in the 2010 Northwest Regional Qualifier is 39 years young. Nancy Mckeage (3rd in Canada) and Megan Smith (2nd in Australia) are both 38 years young. Ashleigh Moe, 1st place in the Northwest is 5'2" and 127 pounds. The original Message Board thread with this information can be found here. Anyone else echo my sentiment? All great athletes, indeed. However, I cannot believe I'm looking at the "top 100 athletes". When stronger regions from CA are smoking the times and scores from the other sectionals and Regionals, but don't come near to placing in their own region due to the depth of the field. my viewpont only supports that the overall average athlete is far above other regions, and thereby having many competitors that are ACTUALLY among the worlds fittest. But due to this oversight, we're forced to watch a field where half the competitors I'm not convinced would be tops in my own gym, much less the world. I long for a time where the SAME WODS determine ALL the competitors, and the top 50 scores or times or what have you, regardless of where they're from, get to compete. From what I hear throughout the community regarding the games, it is more important to see the fittest individuals battling it out, rather than have all the regions represented and thereby eliminating MANY competitors which deserve to be there, because they are fitter than many currently in the field. Agree? Disagree? Why? Why not? 04 July 2010 / 1:29 p.m.
Who are you and where are you from? What CrossFit Affiliate do you train at with gobs of superhuman athletes that would beat the top athletes other regions? I don't necessarily disagree with you, at the same time, you lose a lot of credibility points in my book when you fail to identify yourself, where you're from and who these other athletes are that would beat HALF of the field that qualified for the games. 04 July 2010 / 1:43 p.m. I agree with A.B.S. , but propose a hybrid solution. If the disparity is really to the point where there is a significant difference then perhaps the top 1 or 2 from each regional qualifier get an automatic bid, but then everyone else is thrown into a pool where the top overall (30, 40, 50?) also get bids. This way worldwide geographic representation is still present, but also 'everyone else' who deserves a shot at competing for the title. Workouts would need to be standardized, but I believe they are for the regionals...? It's only sectionals where qualifying workouts differ. As a final note, there is still the online qualifier, although that only gives out a few spots to those who came up just short in their in-person qualifier. 04 July 2010 / 1:48 p.m.
is Rob Orlando really 5'8 or more 5'6ish? I think he is at least 200lbs that beast will do great this year! 04 July 2010 / 2:08 p.m.
if we all did the same wods, then we might as well join a regular gybo gym we are here to test the unknown waters and that keeps us on our feet and trying to improve our weaknesses not only in the gym but out of it. 04 July 2010 / 2:16 p.m. I agree in some respect with A.B.S., but I think you've taken your argument way too far. I like the idea of giving representation to each region, but it should be proportional to the number of competitors who sign up in each region. My complaint a while back was that the Central East region had about twice as many male competitors overall than the Midwest (or Mountain, can't remember the name exactly) but yet got fewer qualifiers. That does not seem fair. But I think you are severely overestimating the superiority of California athletes. And to standardize the workouts poses a TON of logistical problems (weather, quality of equipment, altitude). That just won't work. From what I understand, some regions were at a huge disadvantage in the master's competition because of this. I'd say let the regions decide how they send their own athletes, but base the number of qualifiers on the proportion of overall athletes from a given region. 04 July 2010 / 3:27 p.m. I'm from Australia and we have some smoking hot athletes who didn't make it. It did seem while looking at the regionals, that the Californian events looked very deep. Part of that, I believe, is because we have so much more name recognition for people like Barber, Everett etc, who are part of the Crossfit establishment, that when we see them miss the top ten, we are amazed and simply assume that the depth MUST be better in that region. As before, it may well be true and there is certainly a lot of depth in those areas and the sport is more established there but there is no way to know for sure. For me, I think the fairest way to get to it is to get back to a last minute qualifier thing but enlarge it. So...maybe you have 3 qualifiers from each region and then 12 spots available for a last minute qualifier. This also allows the firebreathers who may have missed out because they had an injury or were eliminated by a piece of chance programming etc (eg Hackenbruck last year). I don't see the downside in this. 04 July 2010 / 3:56 p.m. I love Miles' hybrid solution. I believe a form of this is the only fair way to decide who should be competing in July. Any argument short of that, is simply short-sighted. And Andy, and others, never did I state that my gym is full of firebreathers. I'm simply making the argument that if on average, these are the scores and times as posted, the top 2 or 3 guys, and top 1 or 2 gals have overall better averages than these. And I know they arent the top 50 in the world. Therefore, the fact that they compare very favorably with the averages listed above tells me that a good deal of competing athletes are not among the 50 fittest humans on earth. That's like someone telling me what their FRAN time is, and I comeback with my max clean & Jerk. Wouldnt make sense cause they dont relate. And neither does this, no matter how pissed the veterans in the sport get over this comment, it's still true. 04 July 2010 / 5:21 p.m. So what you're saying is that you think there are a bunch of people who can all Deadlift nearly 500lbs, do 50+ pullups, and run sub-20 5ks, who didn't make it into the top 50? Ok, show me a few. 04 July 2010 / 5:44 p.m.
" But due to this oversight, we're forced to watch a field where half the competitors I'm not convinced would be tops in my own gym, much less the world"
Wow! That is awesome. Where are you located? 04 July 2010 / 6:35 p.m.
A.B.S. competition is a very different beast. When in warm, comfortable, and familiar confines of your own gym there are athletes that will post amazing times. And yet some can not handle the nerves of the games. This has become a sport, and just like every other sport it doesn't matter how fast/strong you are in training, the only thing that matters is the outcome on game day. I for one am by no means the best at my box, or lack there of thanks to the university (Pitt), but i qualified for regionals over my friend who smokes me in wods 75% of the time. There is another level that must be reached at the games to win them, as we've seen time and time again. On a side note, to those headed to Carson City, see you there! Zach and I will be there and are looking forward to partying it up with the CF community. 04 July 2010 / 6:38 p.m. I aspire to be average. Look out for "Old Man' OPT this year! Oh and Andrew M nailed it; you can have all the scores in the world but they don't mean a hill of beans if you can't get it done on competition day. 04 July 2010 / 7:11 p.m. It is my understanding that last year's regional competitions were awarding spots based on the number of affiliates in that particular region I assume this year is similar. I believe that HQ takes into account the number of athletes likely to hail from different regions based on the number of affiliates. I think it is fair. I played with the numbers just the same. Oh, Id have quialified from this region or that region or if this guy wasnt there... By doing that I lost sight of the reason I started CrossFit, the competition with myself. The qualifiing process is young and continues to evolve. The growth in the past three years is incredible, and as CrossFit fine tunes their scoring and events, or WODs we can rest assured that HQ is doing everything they can to fairly determine the Fittest on the Planet, and the best CrossFit Athlete. 04 July 2010 / 8:44 p.m. In support of Andrew Manderino's comment 11 above, I know an athlete whose stats are better than those averaged stats above. In fact, all his stats except Helen and Max Pullups are better. And yet he got positively crushed in the SDAZ *sectional*... didn't even make it to the regionals. The stats are not measuring the capacity that gets tested by competition. 05 July 2010 / 3:54 a.m. I know someone who has a 2:23 fran, 450 backsquat, deadlift 600lbs, run a 57 second 400m. yet he cant do double unders and didnt qualify for regionals. 05 July 2010 / 7:08 a.m.
A.B.S. - you'll be waiting a long time for the qualifying format you long for. all regions doing the same workouts and taking the top 50 was one of the first formats to be considered and rejected by hq. not quite sure what you mean about athletes from CA smoking the workouts from other regions. they didn't compete in those workouts, in the same order, under the same conditions. the athletes that made to the games are super fit for sure but would probably tell you good fortune was on their side too. the workouts programmed, the order, a good or bad judge all play a factor in winning on that day. you seem to want a level of fairness that can never exist. ALL regions have gotten fitter and deeper. i think one solution to your complaint would be to portion out games slots based on participation in the sectional and not number of affiliates. CA probably needs more slots (and i can't believe i'm saying this being from texas) when 400 participate in their sectional and only 100 somewhere else. miles - the regional workouts are not standardized. the online qualifier only applied to military who couldn't get to a sectional this year. not everyone. chad - if you're going to compete in a crossfit competition and you're lacking in a crossfit skill then that's just too bad. learn to do double unders. 05 July 2010 / 7:41 a.m. The athlete you describe is nothing out of the ordinary if you were to look at a field of sprinters. What about 5k? What about overhead? How about his murph time? I know plenty of guys with strong legs who can do a workout with less than 50 pullups. That doesn't make them well-rounded. 05 July 2010 / 10:13 a.m. I have been doing cross fit training since October, 2009 at Cross Fit 5 Cities in Arroyo Grande, CA. I would love to compete in the Cross Fit Games but am unable because of my age. I cannot lift the RX weights presently required of all athletes, irrespective of age. Has anyone thought about age group competition as is done in swimming and track and field? Same disiplines, but perhaps have a scaled weight and assisted/fitness competition. Just a thought from an ever so young 70 year old! 05 July 2010 / 10:44 a.m.
Ken C., very good points. I'm only in it for healthy discussion, not debate or disrespect. Good to know that was considered. @ Chad, that dude sounds legit. 05 July 2010 / 11:43 a.m.
5ft 8" is obviously wrong. I haven't done the calculations, but it's more like 5ft 10.5" to 5ft 11" by the looks of it. There are some errors that need to be accounted for: Moe Kelsey is not six inches tall (more like 6ft 2"), Jason Khalipa is 5ft 9" (not 5ft 12" - ??) and James Fitzgerald is, apparently depending on the year, 5ft 9" or 5ft 10" (not five foot). In other words, the men are of average male height and the women are of average female height. 05 July 2010 / 2:07 p.m.
A.B.S. - its an important discussion and no disrespect intended. it just seems to me you come off pretty harsh when you say half the field of athletes in the games wouldn't even be tops in your own gym? pretty sure they would be. fact is, they all produced on game day given the tasks put in front of them. its that way in every sport there is. 05 July 2010 / 6:40 p.m.
Chuck, I hear 'ya, as I'm 59 and a Masters competitor. Next year, I think I'd do well at "The 60's" but I just think that diminished performance that age brings and the resultant fan base, would mitigate against advanced age groups. I could be all wet though and it'd be very gratifying to be one of the best, no matter how chronologically old we are. Chad-I agree with double unders..as well as probably snatches too. I got badly out-skilled technically in the Regional and if you're really strong but can't double dutch, do kipping pull-ups or snatches, you're screwed. In a way, I like that, to learn new techniques, but those relate certainly more to technique than strength. 05 July 2010 / 6:46 p.m. I'm an OCD freak/math dork and based on the heights you posted for those three athletes the average height is 70.77778 inches or approx. 5' 10-3/4". ("plug" for Microsoft Excel). I quickly checked the weight/age and they look right on. The times/weights take a little more effort, so I am just going to trust that they are much faster and much heavier than I can do. 05 July 2010 / 7:18 p.m. Being a male, I should probably also add that most guys add and inch or two (and I am not just talking about height, haha), so the 5' 8" might actually be more accurate. 05 July 2010 / 7:22 p.m.
My name is Baker Leavitt, CrossfitHyperformance in Savannah Ga. I dont know which competitors would get smoked by the guys in your gym but i can definitely say this. It aint the boys coming from the southeast regionals. look for rich fronning to possibly podium, spence hendel, mike g, and b phillips are all legit beasts, big boys...country boys if you will. also let me say this, CF is still in my opinion at a grass roots level. the system isnt perfect but it works. now i think only taking 50 competitors is a huge mistake. that # should be larger. 06 July 2010 / 5:49 a.m.
1. Move to a ranking system of athletes similar to the one (http://www.thesportreview.com/tsr/2010/02/the-complex-atp-ranking-system-explained/) ATP World Tour uses to rank Nadal and Federer in tennis. Athletes would accumulate points in local/regional "sanctioned" CrossFit competitions, including the Regionals and Sectionals, and be "invited" to the Games based on their rankings. Of course the Regionals would account for the most points but wouldn't automatically gaurantee an invitation to the Games. This way, athletes would have to prove themselves over several events rather than one. 2. Double the number of participants to 100 rather than 50. Why? Because I like 100. 3. Lower the age of the Master's event to 40 years old. 06 July 2010 / 7:47 a.m. In response to the issue of some competitors being eliminated due to a deeper field, I sympathize. Frustrating, no doubt, but to dictate the same WODs for all regions wouldn't work because it would go against the variability of Crossfit. Then, how would you structure the games WODs? Same ones as all the regions' events or something different? If they were different, you'd have people who could have aced it better than the qualifying competitors making this same argument. Anyway, with respect to making this judgment based on the "average" calculations, I'm gonna dig back to the college days - sorry to get all mathy but I think it's worth saying. Technically, a more appropriate mathematical calculation would the mean of all the athlete's stats. The trouble with the average as a representation of a population is the outliers at the low and high ends. Crossfit tests highly variable movements to quantify fitness - someone might have incredible metcon numbers and a relatively low deadlift. Or, low metcons but can lift a truck. These extremes are included when you calculate the average. Once calculated, there is no athlete who will actually look like the "average" athlete. A better calculation would be the median. This would give you an idea of where you'd fall in the spectrum of all the stats since it orders each input and finds the middle. 06 July 2010 / 8:54 a.m. I still haven't seen a name listed above for this ABS character... Did you or anyone in your gym compete in sectionals? Make it to regionals? You've had 4 male winners of the Crossfit Games one from Canada, one from Cali, one from Scandanavia and I'll guarntee you this year's winner won't be from Cali... Froning Jr., Hendel, and Chan are some of the best athletes around... maybe more densely represented areas should split their sectionals and regionals up more than they currently are, but the people controlling the regionals have done a terrific job in representing anerobic/glycolitic/oxidative wods. The above comment by Greg is great... this would a better method... like I said above as long as the three major capacity's are represented in each WOD I think it's fair to a "Crossfit Athlete"
06 July 2010 / 11:08 a.m.
Changing the subject......not a lot of posts on the Games Site about the Masters. This is interesting...comparison of the younger athletes vs .the Masters. Looks like the older you get the better you are...at least for the women...average weight goes down to 130...and if you ask me they are better looking too :)....oh yeah and the men get taller. Data is from the top 15. 07 July 2010 / 11:07 a.m.
Just think of it this way, each country in the Olympics send their best competitors. There are probably MANY Americans who are better than these athletes and would have qualified if they lived in a different country. That's just the way it is...Also, there are many sports that have different routines...gymnastics, ice skating, half pipe, etc...where not everyone is doing the same routine. However, I think we can all agree that the best Athelete is given Gold despite the differences in their routine. 22 September 2010 / 8:37 a.m.
14 November 2011 / 10:26 p.m.